The goal of the exhibition organized at the Musée Cantini is to understand the relationship between theatre and painting from the second half of the 18th century to the early 20th . This is probably one of the most difficult shows to review among the many hundreds already covered on this website. Readers beware, we will in fact have many good but also many bad things to say about it. To begin with, we have rarely seen such a disparity between a catalogue and an exhibition. The latter is remarkable both in the quality of works displayed and the museography. The paintings are very well hung and interact in an intelligent manner. Lovers of historical painting will leave the Musée Cantini satisfied in the knowledge that they have seen one of the most beautiful exhibitions in recent years. There is one caveat, however, and this is the almost total absence of explanations making the visit a bit confusing for a lay person. True, most of the paintings have direct links with the stage. But this obvious association should be clearly stated. And yet, we are never told why such and such a work was chosen, there is never any explanation for sometimes arcane subjects (do visitors know the story of Saint John Chrysostom and the Empress Eudoxia told by Jean-Paul-Laurens ? Does anyone remember the final scene in Rodogune ?). 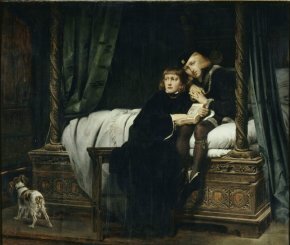 Even the very familiar painting by Paul Delaroche, Edward’s Children (ill. 1) which we can finally enjoy at eye level, deserved to have an explanation of the dramatic scene being played out in an exhibition devoted to theatre and notably in the case of a work where the events unfolded on the canvas are being prepared in the wings. This very regrettable lack of explanations would not be a serious drawback if the catalogue helped in answering the many questions which arise during the visit. It would be an understatement to say it falls short. The very irritating formula of presenting only essays followed by a list of the works exhibited reaches its limits here, to the point of being absurd. The list is made up of a series of numbers, without any historical background or bibliography. More serious still : there is really no bibliography, not even in an appendix. In fact, there is no appendix, list of exhibitions, index, list of places of conservation, biography, even a brief one, of the artists …The essays refer only rarely (and in a very imperfect way) to the paintings displayed, and a section of the catalogue, with the charming title of L’exténuation du romantisme, does not even contain any texts dealing, if only partially, with this theme. We are not criticizing here the essays themselves, often interesting, but this publication resembles the proceedings of a colloquium (which did not take place) rather than an exhibition catalogue. No doubt the organizers ran out of time. We can only hope that the next two stops, at Rovereto and Ottawa, will give them the chance to make up for this disappointment. But, this is only a partial disappointment as, catalogue aside, the exhibition is above all a fine aesthetic achievement. Let us now return to the show and point out the most interesting and most beautiful works throughout the visit. This begins with two paintings by Louis-Jean-François Lagrenée which prove very early on – halfway through the 18th century – the progressive change towards Neoclassicism, particularly Horace after Slapping his Sister (ill. 2) from the Musée des Beaux-Arts in Rouen. While David is represented by well-known canvases (his copy of Girodet’s The Oath of the Horaces, recently seen at the Louvre, and his reception piece for the Ecole des Beaux-Arts), the two works from Bordeaux by Pierre-Narcisse Guérin and the very beautiful Marcus Curtius Dentatus Refusing the Gifts from the Samnites by Pierre Peyron, held at the Musée des Beaux-Arts in Marseille, are admirable. As is often the case in this type of exhibition, the most pleasant surprises come from the lesser-known paintings, discovered a new thanks to excellent restorations. 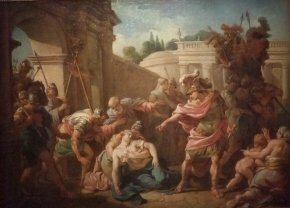 This is the case, for example, of Iphigenia in Aulis by Nicolas Monsiau (ill. 3), excessive in its expression but which does not deserve the label of “grotesque” bestowed by Stéphane Guégan in the accompanying article. This “rhetoric of gestures” seems to us to come not so much from a misunderstanding of David rather than from a successful attempt to translate an opera scene, naturally exaggerated , into painting, thus fully justifying the presence of this beautiful canvas in the exhibition. Special note goes to the beautiful Poussin-like composition by Charles Jalabert, Oedipus and Antigone, which failed to win the Prix de Rome in 1843 awarded instead to Eugène-Jean Damery . The large room which then follows pursues the study of Neoclassicism and Academism. 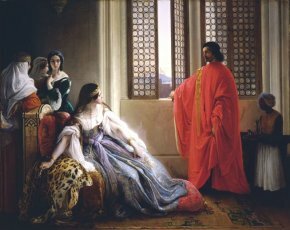 There are several paintings by Francesco Hayez (ill. 4), one of the highlights of the exhibition and surely a revelation for visitors as this great Italian artist is so poorly represented and seldom seen in our country. The essay on the artist is thus particularly welcome. Two works by Cabanel are also worthy of notice, as well as a fine copy after Ingres of Paolo and Francesca (another work for which we would have liked an explanation). 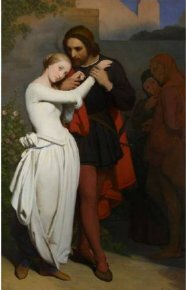 Finally, we would like to point out a large version by Ary Scheffer of his Marguerite and Faust in the Garden (ill. 5), a 2007 acquisition of the National Gallery of Victoria in Melbourne which we had not mentioned. Another remarkable section of the exhibition, on the first floor, is the one on British painting, with only Shakespearean subjects. 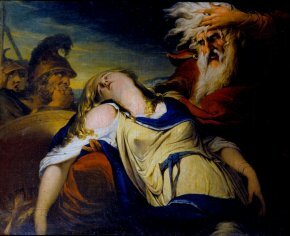 There is notably a large painting by Füseli from Toronto, Lear Drives Cordelia away, along with a very beautiful Georges Romney held at the Galleria Nazionale d’Arte Moderna in Rome and also the spectacular King Lear weeping over the body of Cordelia by James Barry (ill. 6). Yet another masterpiece which alone deserves a visit to this show is Ellen Terry as Lady Macbeth by John Singer Sargent (ill. 7). Chassériau, Delacroix and Gustave Moreau are also well represented, with the latter providing a transition between Romanticism and Symbolism, evoked by Redon and a small painting by Gustav Klimt. The closing section of the visit devoted to Daumier, Degas, Toulouse-Lautrec and the Nabis, reveals a complete change in perspective. The scenes move from the stage to the wings, from fiction to reality ,to use one of the essay titles. In fact, this could almost be an entirely different exhibition. The visit ends with a monographic room focusing exclusively on the work of two theatre decorators from the early 20th century, Adolphe Appia and Edward Gordon Graig. Although the reason for these choices as relates to the subject is intriguing (why they and why so many works ? ), this is a chance to discover two artists with a powerful plastic style who were very innovative for their time. The exhibition closes, in the same way it began, with magnificent works, illustrating a message whose complexity is not always clearly stated. Under the supervision of Guy Cogeval and Béatrice Avanzi, De la scène au tableau, Editions Skira/Flammarion, 2009, 384 p., 44€. ISBN : 978-2-0812-3691-2. Visitor information : Musée Cantini, 19 rue Grignan, 13006 Marseille. Open every day except Monday from 10h00 to 17h00. Rates : 8€ (reduced : 6€). The works from the Musée Cantini are in large part displayed at the Vieille Charité during the exhibition. Even the dates of birth and death of the artists are missing in the catalogue. 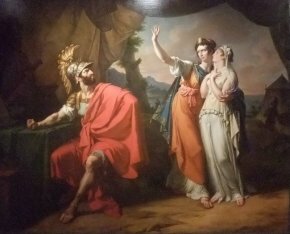 Iphigenia in Aulis by Gluck was performed in Paris almost every year between 1774 and 1799, and between 1811 and 1816 (source Chronopéra ; the painting dates from 1817). An example – and there are many – of a canvas in the exhibition which is never quoted in the catalogue, unless we are mistaken, except for the reproduction. An entry for this painting and that by Antoine Thomas, Oenone Refusing to Help Paris (cat. 20) could have explained the relation between the Prix de Rome and the theatre in the 19th century.